Armaura, a giant eagle, is terrorising the cannily named Eagle Island and only the duo of Quill and Koji can bring an end to its reign of the skies. Eagle Island, from Pixelnicks, is a rogue-like platformer with a beautiful, SNES-inspired palette and a falconry-based weapon system. 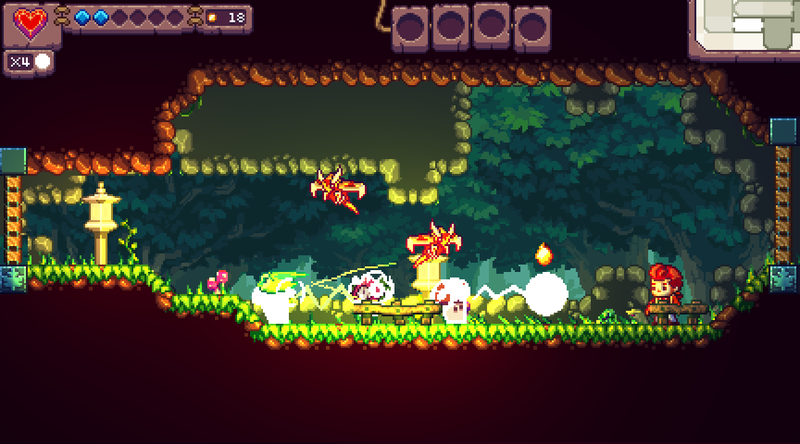 Yes, a falconry based weapon-system; the protagonist Quill can simply run, jump and climb — he deals damage to enemies using his trusty owl Koji, who can surge in specified directions and be empowered with elemental effects. I played through an extensive demo of Eagle Island whilst at EGX earlier in the year, spending a lot of time exploring the often-showcased forest areas. Koji’s elemental powers were unlocked for this part of the demo, so I had time to tinker with the different effects. The control system is surprisingly easy to use, with the flinging of Koji and the changing of elements a lot easier to use than I expected — what with Koji’s dash operating on an eight-point axis. Eagle Island’s true strength, in my opinion, comes in the general vibe of how it handles feedback. A lot of care has gone into balancing things like combo-attack hang-time and the gems you gain at rapid speed. Everything explodes or animates in some way — from the chests exploding currency everywhere to the puffs that follow enemies’ explosions — everything about it reeks of attention to detail. Each of the game’s procedurally assembled levels feel scripted and deliberate — a true sign of quality assembly — although it will be interesting to see how long it takes before elements seem familiar. Eagle Island will ship with Story, Roguelite and Speedrun modes; eighty-five different perks; sixteen different environment sets; and twelve bosses including Armaura, the eagle of the game’s name. If you’re interested in finding out more about Eagle Island, you can download the demo from Pixelnick’s Itch.io page or follow the developer on Twitter. Eagle Island will be launching on PC, Mac and Linux in 2018.